On April 9, 2019, the defense attorneys at McNeal Schick secured the dismissal with prejudice (PDF link) of Section 1983 claims against individual defendants and secured the dismissal without prejudice of supplemental state law claims in a civil conspiracy, defamation and assault claim in the U.S. District Court, Northern District of Ohio. For further information, please contact Brian T. Winchester (btw@msablaw.com) or Jesse M. Schmidt (jschmidt@msablaw.com). On March 27, 2019, the premises liability attorneys from McNeal Schick secured a summary judgment ruling (PDF link) in favor of their client, a property owner, who was sued for a sexual assault that occurred at the premises. After forcing the dismissal of some of the claims, the Court then granted summary judgment on the balance of the claims against our client based on a lack of foreseeability. For further information, please feel free to contact Brian T. Winchester (btw@msablaw.com) or Jesse M. Schmidt (jschmidt@msablaw.com). 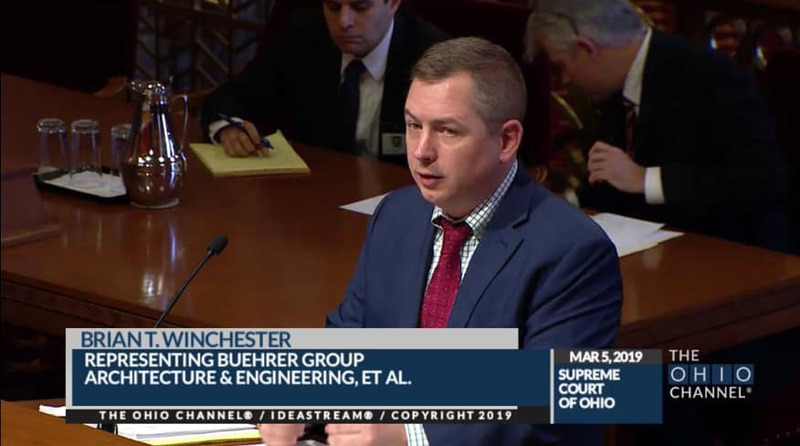 On March 5, 2019 McNeal Schick Partner Brian Winchester argued before the Ohio Supreme Court. The case involved the significant legal issue of whether or not Ohio’s Real Property Statute of Repose applies to breach of contract claims. McNeal Schick was retained to assume the defense of the architect following an adverse Court of Appeals decision and successfully obtained Supreme Court review of the issue and garnered the support of multiple amici which filed briefs in support of our clients’ position. The matter was taken under advisement by the Court and we will await the decision of the Ohio Supreme Court and update as necessary. Should you have any questions, please feel free to contact Brian T. Winchester (btw@msablaw.com). On February 21, 2019 the Construction and Professional Liability Lawyers of McNeal Schick received a favorable ruling from Ohio’s 10th District Court of Appeals (pdf link) affirming Summary Judgement in favor of the firm’s client, an architect, who was sued for an alleged defective condition reportedly causing plaintiff to slip and fall. In addition to numerous discovery issues in the litigation, the Trial Court decision and later the Court of Appeals decision found that the firm’s client met its standard of care and the claims were barred by Ohio’s Statute of Repose. If you would like further information contact Brian T. Winchester (btw@msablaw.com) or Jesse M. Schmidt (jschmidt@msablaw.com). On February 6, 2019, the insurance coverage lawyers of McNeal Schick secured a summary judgment ruling (PDF link) in the Lorain County Court of Common Pleas in favor of an insurance carrier. The Court held that the insurance carrier had no duty to defend or indemnify the insured for a property damage claim stemming from a motor vehicle collision. The Court found that the insured removed his liability coverage from the applicable policy of insurance prior to the subject incident and cannot receive liability coverage under a policy of insurance for which premiums were not paid. For further information, contact Patrick J. Gump (pgump@msablaw.com) or Brian T. Winchester (btw@msablaw.com). On January 4, 2019, the civil defense lawyers of McNeal Schick successfully secured the dismissal of a defendant in a motor vehicle accident based upon the expiration of the statute of limitations and prior United States Supreme Court precedent as to the unconstitutionality of Ohio’s tolling of the statute of limitations for motor vehicle claims. The matter was filed in the Lucas County, Ohio Court of Common Pleas. If you would like further information, contact Brian T. Winchester (btw@msablaw.com) or Chad A. Schmitt (cs@msablaw.com). McNeal Schick is proud to recognize John C. Cubar and Brian T. Winchester for once again being recognized by their peers. Decades of work and dedication do get recognized in the legal field. Both partners were selected for inclusion in the 2019 edition of Ohio Super Lawyers in the area of Construction Litigation. The selection process resulted in only 32 lawyers in the entire State of Ohio being recognized for inclusion in this practice area. After being retained by a homeowners insurance carrier and intervening for that insurer in the underlying lawsuit against its insured for alleged nondisclosures on sale of a property and ancillary personal injury claims, the insurance coverage lawyers of McNeal Schick secured a declaratory judgment ruling (PDF link) in favor of their insurance carrier client. The Cuyahoga County Court of Common Pleas ruled that the insurer had no duty to defend or indemnify its insured on the underlying claims. The claim involved multiple lawsuits, experts, depositions, insurers, parties, and claims. But after nearly two years of litigation, we were ultimately able to prevail. If you would like further information, please contact Jesse M. Schmidt (jschmidt@msablaw.com) or Brian T. Winchester (btw@msablaw.com). After assuming the defense of an engineering firm upon refiling of a lawsuit which had been litigated for several years, the professional liability attorneys of McNeal Schick actively and aggressively changed the litigation strategy, successfully securing dismissal of all claims (pdf link) against the engineering firm. The multi-party lawsuit stemmed from the collapse of a 300’ long manure barn wall and involved an alleged $1.7 Million plus in claimed damages. After first securing partial dismissal of some of the claims through a Motion to Dismiss, there were still claims pending requiring the filing of a Motion for Summary Judgment (pdf link) which was ultimately granted by the Licking County, Ohio Court of Common Pleas. If you would like further information, contact Brian T. Winchester (btw@msablaw.com) or Patrick J. Gump (pgump@msablaw.com). On October 18, 2018, the construction litigation lawyers of McNeal Schick secured a ruling (pdf link) granting partial judgment on the pleadings, finding that on claims sounding in contract, Ohio law does not allow punitive damages. The Court further explained that attorney’s fees are not recoverable on contract claims absent language in the contract allowing the same, which was not present in the contract at issue. In the same ruling, the Court also denied Plaintiff’s Motion for Leave to Amend its Complaint to add a count based on frivolous conduct. For further information, contact Jesse M. Schmidt (jschmidt@msablaw.com). On July 26, 2018, the personal injury lawyers of McNeal Schick secured a summary judgment ruling (pdf link) in the Lorain County Court of Common Pleas, in favor of a tavern owner client, stemming from an automobile accident involving a patron who left the establishment and allegedly crossed the center line on a nearby road, causing the death of another motorist. The decedent’s estate administrator sued the bar owner and building owner entities for wrongful death, on behalf of the decedent’s family, alleging that both entities committed a violation of Ohio’s Dram Shop law, which prohibits a liquor permit holder from serving a noticeably intoxicated patron whose intoxication proximately causes the death of another. The Plaintiff also alleged that tavern employees spoliated, or deliberately destroyed, video surveillance evidence. Punitive damages were sought on both claims. McNeal Schick attorneys filed for summary judgment on all liability issues. This prompted an agreement to dismiss the building owner client, who legally could not be held responsible. The Court then issued an opinion ruling in favor of the tavern owner client, finding that there was insufficient evidence that the patron was served while noticeably intoxicated and that the video evidence was overwritten prior to notice of the Plaintiff’s claim, without any intent to disrupt the claim. For further information, contact Jesse M. Schmidt (jschmidt@msablaw.com) or Brian T. Winchester (btw@msablaw.com). On July 12, 2018, the insurance coverage lawyers of McNeal Schick secured a summary judgment ruling in the Trumbull County Court of Common Pleas (pdf link) in favor of a general liability and umbrella carrier finding no duty to defend or indemnify the insured for an alleged significant personal injury claim stemming from an alleged defective product. The injury litigation was filed in Allegheny County, Pennsylvania while we proactively litigated the issues in Trumbull County, Ohio. The coverage issues involved alleged post-loss waiver of coverage and the impact of a products-completed operations exclusion. For further information, contact Jesse M. Schmidt (jschmidt@msablaw.com) or Brian T. Winchester (btw@msablaw.com). Following an adverse appellate decision, McNeal Schick was retained to assume the defense of the design professional in a multimillion dollar design and construction defect claim. We are pleased to announce that on May 23, 2018 the professional liability and appellate lawyers of McNeal Schick secured the Ohio Supreme Court’s acceptance of jurisdiction (pdf link) to review the important issues raised by the adverse appellate ruling related to the scope of the application of Ohio’s 10 year statute of repose for construction related breach of contract claims. With the support of multiple amicus curiae in support of our client’s position in front of Ohio’s Supreme Court, we hope to obtain favorable industry guidance on this important construction industry issue. If you would like further information, contact Brian T. Winchester (btw@msablaw.com) or Patrick J. Gump (pgump@msablaw.com). On May 3, 2018, the appellate lawyers of McNeal Schick secured a decision (pdf link) from the Eighth District Court of Appeals in favor of their general contractor client in regards to the enforcement of an arbitration clause in a subcontractor agreement. The subcontractor filed suit against the general contractor under the subcontractor agreement claiming breach of contract and violation of the Ohio Prompt Payment Act. The Trial Court refused to enforce the arbitration clause that was mutually bargained for by two commercial entities. The Eighth District Court of Appeals reversed the Trial Court’s decision and found the arbitration clause valid and enforceable. If you would like more information contact Patrick J. Gump (pgump@msablaw.com) or Brian T. Winchester (btw@msablaw.com). On April 10th, 2018 the trial lawyers of McNeal Schick secured a Magistrate’s Decision in favor of their client, an auto repair shop following a bench trial. The repair shop performed mechanical work on Plaintiff’s vehicle, which was subsequently lost to an underbody fire. Following the loss, Plaintiff filed suit against the shop claiming that the fire which resulted in the loss of her vehicle was a result of the repair shop’s work. McNeal Schick Attorneys argued that the available facts did not suggest that the client was responsible for Plaintiff’s loss and that Plaintiff could not establish actual causation on the part of the shop. If you would like more information contact Chad A. Schmitt (cs@msablaw.com). On March 28, 2018, the insurance coverage lawyers of McNeal Schick secured a summary judgment ruling (pdf link) in favor of their insurance carrier client. The insured filed suit claiming that there was coverage for water infiltration and property damage in spite of the fact that the damage was caused by faulty workmanship. The Cuyahoga County Court of Common Pleas interpreted the exclusion for coverage and the ensuing loss provisions and found that coverage was not afforded for this loss granting summary judgment in favor of the firm’s client. If you would like more information contact Brian T. Winchester (btw@msablaw.com) or Jesse M. Schmidt (jschmidt@msablaw.com). On March 2, 2018, the insurance coverage lawyers of McNeal Schick secured an agreed dismissal of all claims with prejudice (pdf link) in favor of their client, the owner of a bar / restaurant operating in a leased commercial space, without any settlement payment. After a significant fire loss, the client was sued by the building owner, who alleged the client was responsible for the fire and resulting property damage and demanded payment of over $200,000. With the support of an expert engineer who analyzed the cause of the fire, McNeal Schick attorneys argued the client was not responsible. They also argued that the plaintiff-lessor legally waived its right to pursue the client for the damages. If you would like more information, contact Jesse M. Schmidt (jschmidt@msablaw.com) or Brian T. Winchester (btw@msablaw.com). On February 24, 2018, the premises liability lawyers of McNeal Schick obtained a jury verdict in the Lorain County Court of Common Pleas. This case involved a trip and fall at a rental property owned by our client. Plaintiff sustained tibia and fibula fractures as a result of the fall and went through an open reduction internal fixation surgery for the fractures resulting in the permanent installation of plates and screws. Medical damages claimed were nearly $50,000 of billed expenses on approximately $17,000 of paid medical expenses. The jury returned a gross verdict of $40,000 consisting of $17,000 in economic loss and $23,000 in non-economic (pain and suffering) damages. After allocating negligence to Plaintiff and several non-parties, the net verdict against our client was $15,200. If you would like further information, contact Brian T. Winchester (btw@msablaw.com). On January 25, 2018, the insurance coverage lawyers of McNeal Schick obtained an appellate victory (pdf link) in the Eighth District Court of Appeals in favor of their client, an insurance carrier, on the issue of whether a commercial automobile policy of insurance issued to an Ohio limited liability company provides underinsured motorist coverage to a claimants that were injured outside the course and scope of their employment with the named insured limited liability company. The Eighth District Court of Appeals followed the Supreme Court of Ohio’s decision in Westfield v. Galatis, 2003-Ohio-5849, and held that the applicable policy of insurance does not provide coverage to claimants injured outside the course and scope of their employment with the named insured business entity. Further, the Court held that the applicable commercial automobile policy of insurance did not contain specific language to the contrary as required in Westfield v. Galatis. If you would like further information, contact Patrick J. Gump (pgump@msablaw.com) or John C. Cubar (jcc@msablaw.com). On January 12, 2018, the premises liability lawyers of McNeal Schick secured a summary judgment (pdf link) in the Ottawa County Court of Common Pleas in favor of their client, a local restaurant, on claims that the Plaintiff’s significant physical injuries were caused by the negligence of the restaurant in permitting a dangerous condition to exist on its premises. If you would like further information, contact Patrick J. Gump (pgump@msablaw.com). On January 9, 2018, the professional liability lawyers of McNeal Schick secured an appellate victory (pdf link) in the Fifth District Court of Appeals in favor of their client, a design professional, on claims that the design professional breached its contract with the State of Ohio in providing professional engineering services in the construction of a structure that was substantially completed more than twenty years ago. The Fifth District Court of Appeals held that Ohio’s Statute of Repose, R.C.2305.131, applies to actions brought against design professionals for injury to person or property caused by a defective or unsafe improvement to real property, whether such action sounds in tort or contract. Moreover, the Court of Appeals held the doctrine of nullum tempus, a “prior rule of law of this state,” shall not prevent application of the Statue of Repose. If you would like further information, contact Brian T. Winchester (btw@msablaw.com) or Patrick J. Gump (pgump@msablaw.com). McNeal Schick is pleased to announce that John C. Cubar and Brian T. Winchester have again been nominated by their peers and selected for inclusion in the 2018 edition of Ohio Super Lawyers and at SuperLawyers.com. This selection is limited to the top 5% of attorneys in the State of Ohio through the Super Lawyers peer-reviewed and research-validated process. It should also be noted that for the Construction Litigation area of practice, John and Brian are two of only 33 lawyers across the entire State of Ohio selected for that practice area. On October 23, 2017, the trial lawyers of McNeal Schick obtained a defense jury verdict (pdf link) in the Richland County Court of Common Pleas in favor of their client, an HVAC technician, regarding claims for property damage and punitive damages. Plaintiffs (property owners and subrogated insurance carrier) alleged that the Defendant breached his standard of care in allegedly causing a fire that caused significant damage to a home. Liability and damages were both contested. If you would like more information, contact Brian T. Winchester (btw@msablaw.com) or Patrick J. Gump (pgump@msablaw.com). On October 18, 2017, the insurance coverage lawyers of McNeal Schick secured a declaratory judgment (pdf link) in the Lorain County Court of Common Pleas in favor of their general liability insurance carrier client that it did not owe a duty to defend or indemnify its insured on a claim for violation of Ohio’s Dram Shop Act in spite of claims within the Complaint that the insured committed additional acts of negligence beyond violating the Dram Shop Act. If you would like more information, contact Brian T. Winchester (btw@msablaw.com) or Marilyn J. Singer (mjs@msablaw.com). On October 12, 2017, the professional liability lawyers of McNeal Schick secured a summary judgment (pdf link) in the Franklin County Court of Common Pleas in favor of their architect client on multiple claims of professional malpractice stemming from a condominium complex fire reportedly causing nearly $600,000 in property damage. If you would like more information, contact Brian T. Winchester (btw@msablaw.com) or Patrick J. Gump (pgump@msablaw.com). On July 5, 2017, the premises liability lawyers of McNeal Schick secured a summary judgment (pdf link) in the Cuyahoga County Court of Common Pleas in favor of their client, a church, on claims that the Plaintiff’s significant physical injuries were caused by the negligence of the church in creating or allowing a nuisance to exist on its premises. If you would like further information, contact Brian T. Winchester (btw@msablaw.com) or Jesse M. Schmidt (jschmidt@msablaw.com). On June 29, 2017, the professional liability lawyers of McNeal Schick secured a summary judgment (pdf link) in the Franklin County Court of Common Pleas in favor of their architect client on a slip and fall claim alleging faulty design as the cause of the Plaintiff’s fall and subsequent injuries. If you would like further information, contact Brian T. Winchester (btw@msablaw.com) or Jesse M. Schmidt (jschmidt@msablaw.com). * The results and summaries provided on this website describe results obtained in matters handled by Attorneys of McNeal, Schick, Archibald & Biro Co., L.P.A.. These descriptions are meant only to provide information about the activities and results obtained by our attorneys. They are not intended as a guarantee that the same or similar results can be obtained in every matter undertaken by our attorneys. You should not assume that a similar result can be obtained in a legal matter of interest to you. The outcome of a particular matter can depend on a variety of factors, including but not limited to the specific factual and legal circumstances, the ability of opposing counsel, and, often, unexpected developments beyond the control of any client or attorney.